As noted in the previous post, the basic turn structure is A)move to a new Region, then B) draw a card to see if an event happens there, based on matching up the land icons on the card with the region where the player is currently at. While the last post contained all of the information required for basic monster creation and handling (although not combat), which is run using the letter symbology, the question remains: "What happens if you draw an event that ISN'T a letter?" As say, for example in the card to the left here? The +1 icons are a good thing. Instead of a creature encounter, this allows you to add or improve buildings to your little paper empire. 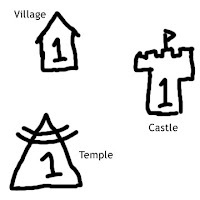 There are three types of buildings in the game: Villages, Temples, and Castles. You've already started with a Village when the game began. If you are in a Region where an Event DOESN'T happen, then you "visit" the building in that Region (if there is one) and perform the special actions that those Buildings can trigger. Villages allow for rest, which will restore lost Health. Temples allow for study, which increase your character's Level. Castles allow for Quests, which let you go on specific "adventures" to gain big gold and magical treasures. Getting a +1 icon from an Event card let's you build a new Level 1 Building of your choice in any Region that does not currently have a Building. Only one Building per Region please! Or, you can increase any pre-existing Building's Level by 1, up to a maximum of 10. At this point, the game needs to have a bit playtesting to determine the best cost ratios for each action that the buildings can provide. But it's best to start simple. Paying 1 gold to a Village will restore an amount of Health equal to the Village's Level. Paying "100 times the desired next level" in gold at a Temple will increase your character's Level by 1, and increase your character's maximum Health by 50. Additionally, you cannot increase your character's Level beyond that of the Temple's Level. Example: Increasing your character's Level from 2 to 3 would require you to find/create a minimum Level 3 Temple. Pay 300 Gold at that Temple, to increase. Creating Quests are worth another post. But the only thing that's missing from this being playable is combat. So that will be coming next. From 1991 to 1999 I worked for Williams/Bally/Midway, in the pinball, and then later, in the slot machine design departments (and then back again into pinball). I started off as a lowly dot matrix animator, but bounced around across different departments fairly regularly, depending on the needs at the time. Anyway, much like any geek-y crowd, there's a big internet following for pinball (or what remains of it). One of the more generally interesting website is a collection of audio interviews of various "pin-heads" and pinball programmers which can be found by clicking on this this link. While most of these names are probably foreign to the board game crowd, to the pinball crowd, many of these names are held in the same light as Knizia, Moon, Faidutti, and Wallace. And often in the same regards to design styles and themes. "I love the fast action flow of Steve Ritchie games" equates to "I love complex buisness engines of Wallace train games" kind of thing. The names of the people may be unknown to those outside the hobby, however, the names of a lot of the games they designed aren't. With the recent acquisition of a shiny new mobile phone that can play MP3, I've been listening to a collection of interviews with the various people who I've worked with in the past. So, I can't really vouch for the interviews of people who are spending hours talking about, say, how to rebuild electrical coils or whatever, but the interviews of people who actually worked and designed these games are interesting to listen to as a whole. It creates this interesting picture of all these people who followed various threads in their life, who all came together to work on one specific type of product, and then went their own ways again. I had been asked at one point to be interviewed, and sort of declined. I had always been bothered by the "how can I make a buck out of my hobby" that pinball enthusiasts have seemed to have, and didn't want to feed into that. But now seeing this as a project that brings together a bunch of threads and makes a layered tapestry puts a different light on the subject. One podcast that I've recently finished that if worth listening to is the interview of George Gomez (TOPcast show 40). Aside from being one of the guys who I've had probably the best pleasure to work with, he really knows his stuff (both creatively and industrially), he touched a wide variety of arcade games across different companies, and he worked for Marvin Glass (one of the top game and toy development houses before they broke apart). Plus he's a very interesting and honest speaker to listen to. It's worth the time to listen.